And so, today’s that ‘nother day. Okay, so, you’re back. And if that didn’t turn you on, then you ain’t got no switches. Although card flourishes have been a part of card magic for a long time, the world of cardistry was born within the past twenty years, essentially founded by the Buck Twins, Dan and Dave Buck, who today operate a multi-million dollar business, represented online as www.artofplay.com and www.artofmagic.com. Acknowledging that that’s just the tip of the iceberg—a century-and-a-half of artistic discussion, debate, and development that I’ve just attempted to summarize in about a hundred words—the point is this: That skill speaks to method, and not to effect. If magicians hope to get the audience to transcend thoughts of puzzle-solving, and how-did-he-do-it, and rather be willing to enter into and give themselves over to a unique artistic experience of mystery and adult wonder, we’re undermining our own cause by offering open displays of skill, that invite unwarranted attention on the notion of skill as the method—and worse still, perhaps the entire content and experience—of magic. Now, while I am largely supportive of this point of view, I actually live somewhere slightly on the arc, rather near to the end that lies where there is no skill, as opposed to all skill, being displayed. But I’m not quite at the extreme end of that bell curve. Among the greatest sleight-of-hand artists I’ve known, the likes of Dai Vernon and Michael Skinner sometimes—occasionally—judiciously—deliberately—were willing to demonstrate a little skill now and then. They absolutely acknowledged the risks, and they mostly eschewed such displays. Bill Simon, in the introduction to his marvelous cutting-edge book of the era, Effective Card Magic, published in 1952, commented that, “It is all a matter of individual taste. I know of one card man who will not fan the deck for a selection of a card. He feels that any display of skill with cards will detract from the strength of his effects. I know of another who precedes all of his effects with a quick display of one-handed cuts, fans, manipulations and arm-spreads. Who is right? I imagine they both are.” But he added, “Personally, I don’t do many flourishes or manipulations. … It is up to the individual to decide which is the best policy to follow, but keep in mind that anything done well (be it with a deck of cards, or a machinist’s lathe) is invariably of interest to people [emphasis per original]." I do think there is a bit more to it than simply leaving it to personal taste, but I hope that’s sufficient to serve as background in trying to explain why magicians rebuffed the early rise of cardistry with resistance and even scorn. For magic, it may be one thing do insert a flourish or two in the course of a performance, to arouse interest, to impress, or to simply provide a pleasing visual effect. It’s quite another thing, however, to lay the magic aside and perform lengthy sequences of card juggling. Because that’s what cardistry is: it’s a form of juggling, constructed around fancy cuts and shuffles with playing cards. Whatever it is, it’s not magic. What served to further fuel the artistic and cultural conflict was that with the rise of cardistry also came the explosion of collector playing cards. New designs of playing cards, designed for beauty, novelty, rarity and expense, exploded into the online marketplace, and today comprise a multi-million dollar industry. A number of online magic sites make as much or more money on novelty playing cards than they do selling magic or magic instructional materials like books and videos. This too is seen as anathema by many magicians, because the first thought that occurs to many in the face of magic is that the props must be suspect; to wit, "It must be those special tricks cards that are responsibile." And on a broader aesthetic scale, the traditional point of view reflects that part of the inherent power of magic done with cards and coins lies in, and indeed is enhanced by, the absolute ordinariness of these properties. The last thing I ever want to hear is, “Wow, cool cards!” I want the cards themselves to be ignored, to be taken entirely for granted as the commonplace drugstore items they are. Magic is the art of making the ordinary, extraordinary. Not making the extraordinary, kinda neat. These issues have been argued elsewhere (and I have written about them at greater length elsewhere), but I summarize them here as context for the newcomer to the form. While some would insist there should be neither conflict nor distinction made between card magic and cardistry, I find this a brainless pose. The founders of the movement, however, Dan and Dave Buck, eventually figured out the distinction, and how to clarify it, to their own advantage, and to the gratitude of many (including me). By creating the two distinctly separate websites cited above—Art of Magic devoted to magic, and Art of Play devoted to cardistry—they essentially resolved the issue (as well as strengthened their branding). The Bucks have even created two conventions, each serving a different one of their dual passions. (And make no mistake, the Bucks love and appreciate magic and magicians.) At the first Magic-Con, held in 2010 in San Diego (where I presented a workshop), young cardistry enthusiasts mixed with veteran magicians. Most of the former group had never attended a magic convention before, and most of the magicians featured on stage were unknown to them. (They were thrilled to be hanging one-on-one with the Bucks however.) It was an interesting phenomenon to witness, and my only disappointment was that there was little programming that was explicitly designed to try to get the two demographics a bit more connected. Enough of all that. What has been missed in all this is that the phenomenon of cardistry has become its own community, a word constantly emphasized by its practitioners. That community is international, and facilitated by social media in general, and YouTube in particular. While veteran magicians are driven to distraction by watching young people upload videos of their practicing of magic that they have yet to perfect, or worse still, randomly posting mere explanations and exposures of conjuring methods for purposes that lie far from the advancement and appreciation of the art of magic, nevertheless, YouTube and cardistry are a perfect match: a way to trade skills and ideas and passions, in a field that, like all juggling, thrives on sharing rather than secrecy. 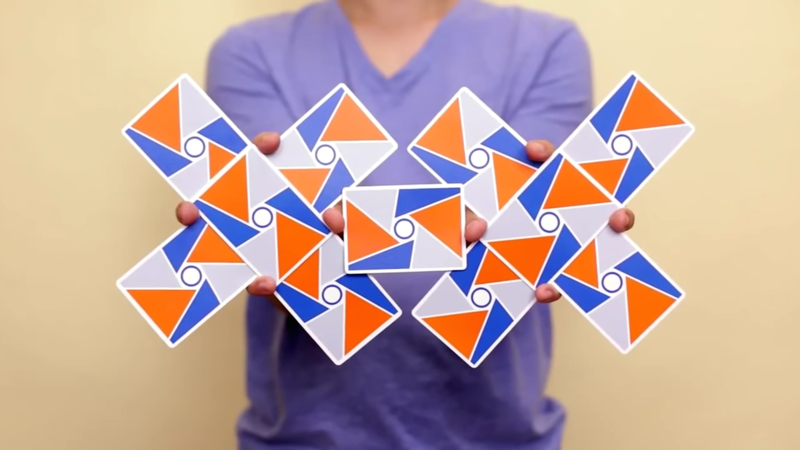 Cardistry, much like juggling, is an open-source culture. While one often comes across references to skateboarding as a way of understanding cardistry, the element of athleticism in skateboarding is off the mark, while the element of community is on target. More useful I think are comparisons to Yo-Yoing, and Cubing (as in Rubik’s Cube). These pursuits unarguably combine elements of the artistic, physical, and intellectual, and they are equally welcoming and useful to a kid with a passing interest, or one who rises to the award-winning heights of competition. Along and throughout that spectrum, these passions long ago sprouted communities of young people who communicate, learn, and share, and gain countless benefits from the experience. Cardistry is a welcome addition, and shares these same traits. And while I believe that collector and novelty cards detract and distract from the aesthetics of card magic, the cards can often be beautiful, and the natural affinity that adolescents bring to collecting lends an appealing "cool" factor to the marriage of cardistry and collecting. Years ago, I performed and lectured at a convention of the Canadian Association of Magicians. Because I am invariably frustrated by the limitations of the typical one-hour convention lecture format, I asked that I be given a spot late Friday night, after the main show, to present my lecture, thereby allowing for the lecture to run later and longer if interest justified it. It ended up running quite late, thanks in part to a group of attentive young magicians who filled the front row and stayed right to the end. I was grateful for their focused and enthusiastic support. Late the next night, I was in a suite with many of the convention performers. Another performer came in and told me a bunch of young card guys were hanging out in the hallway (as invariably happens at such gatherings). I immediately went out to join them, and we hung in the halls till the wee hours, trading card talk and moves and magic. Several of the teens were also into cardistry (this is still before that term had been coined). I watched and enjoyed the work they were showing and sharing. I have one more video to show you, and I only came upon this as I was writing today. It’s another newly posted cardistry video, a brief autobiography by a young cardist who goes by "Sean O." It includes some nice moves, but more importantly, it reveals an intensely personal and authentic perspective on the community of cardistry, and the values it serves. It’s a cogent explanation. Don’t just watch, but listen. Enjoy. A Boy And His Cards - A Cardistry Documentary by Sean O.